Mary Mason was among the leadership of such New York charitable organizations as the Female Assistance Society, the Asylum for Lying In-Women, and the Female Benevolent Society. She was a founder of the Sunday school movement in New York City, taught at the Five Points Mission, and for more than thirty years ran a day school in her home. She is also remembered as a founder and director of the New York Female Missionary Society of The Methodist Episcopal Church. Mary W. Morgan grew up in Philadelphia, where she graduated from the Young Ladies’ Academy at the age of 17, prepared to be a teacher. After converting to Methodism, Mary Morgan accepted an invitation to teach at a new Society of Friends school for girls in New York. Mary Morgan’s life-long concerns were education and women’s needs. Her first organized benevolent effort was a spontaneous reaction to the needs of destitute women in her neighborhood. The women named their group the Female Assistance Society. Morgan was elected its secretary and remained an active member for nearly 50 years. Better known to Methodists is her involvement in the Sunday school movement. Mary Morgan’s contemporaries credited her with founding the first Methodist Sunday school in New York. As a result of her efforts, a regular Methodist Sunday school opened in November 1815, and Mary Morgan was the school’s female superintendent. In April 1817, she married the Rev. Thomas Mason, a South Carolinian who had been appointed Assistant Book Agent of the Methodist Book Concern at the 1816 General Conference. The Masons had ten children; four girls and five boys lived to adulthood. She left the Friends’ School in 1818 when pregnant with her first child, but soon opened a private school in her home, which she continued for 34 years. The organizing meeting of the New York Female Missionary Society was held on Mary Mason’s 28th birthday, July 5, 1819, at the Wesleyan Seminary on Forsyth Street. One of the first orders of business was the election of officers. 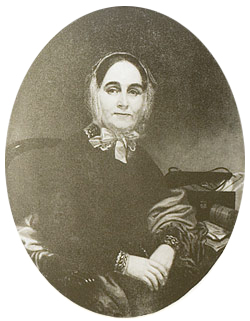 Mary Mason was elected First Directress. The Female Society’s object was “to assist the several Annual Conferences more effectually to extend their missionary labors throughout the United States and elsewhere.” Where “elsewhere” might be was as yet undetermined in 1819. The auxiliaries’ primary duty was to raise money for the Parent Society, usually in the form of memberships. Under Mason’s direction, the Society began developing relationships with specific missions and missionaries. They began with the largest Methodist mission of the 1820s, that of James B. Finley and the Wyandotts of Ohio. The New York Female Missionary Society was one of the earliest supporters of missions to Liberia. In 1831, before anyone had heard of Melville Cox, the Female Society gave $100 to the Parent Society for the planned Liberian mission. Mary Mason’s own interest in Liberia was not limited to the work of the Female Society. In December 1834, she helped organize the “Female Society of the City of New-York for the Support of Schools in Africa,” and was named to its Executive Committee. Early the next year, she and her husband formed a Juvenile Missionary Society at the Greene Street Church. Its main focus was Africa. At least three of the Mason children were active in the Society. Another who responded to Liberia’s call was a school teacher named Ann Wilkins. She served a remarkable 19 years in Liberia. She is best known for the girls’ school she established at Millsburgh, north of Monrovia on the St. Paul’s River, but her most important contribution may be in demonstrating that a single woman could be an effective missionary, even in a deadly climate. Like the other missionaries and teachers, Ann Wilkins was employed by the Parent Society, which in turn relied on the auxiliaries for the necessary funds. The connection between missionaries and auxiliaries could go far beyond the simple collection and distribution of funds once a year. This was particularly true of the relationship of Ann Wilkins, Mary Mason, and the New York Female Missionary Society. For nearly 20 years, Mason and the Society served Ann Wilkins as lobbyists, confidantes, outfitters, and advisors. Adapted from Susan E. Warrick, “’She Diligently Followed Every Good Work’: Mary Mason and the New York Female Missionary Society,” Methodist History 34:4 (July 1996): 214-229.